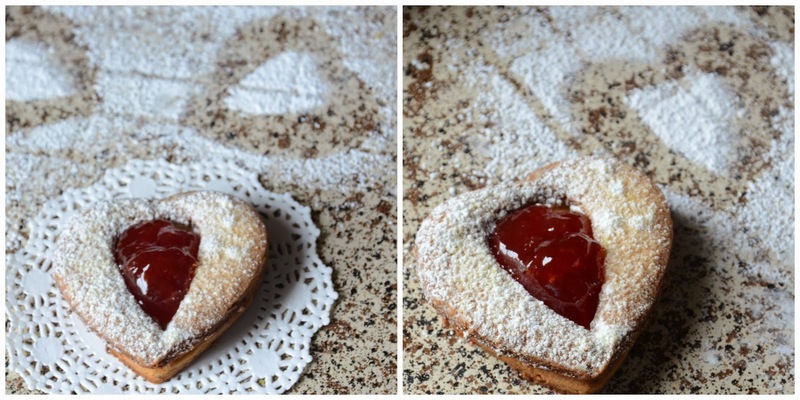 Linzer cookies are like shortbread cookies, that are sandwiched together using jam. This tastes so good and easy to follow. I used almond paste to the dough. We can use almond meal or hazelnut powder instead. When I made these cookies , it was snowing lightly in Irving. Crazy blogger mind, asked me to take picture on snow. It was around - 6 degrees F. After taking few shots, I cannot feel my hand, it was that frozen. But completely happy with the outcome. Nature is beautifull on it own.I just made 10 cookies, by quartering the recipe. It got vanished in a minute. The zest of orange and lemon makes the cookies so aromatic. The cold butter makes the cookies melt in your mouth.These are so delicate, so take care not to overbake the cookies, if not it will change colour immediately. * Blanch the alonds. That is, put the almonds in hot water and leave it aside for 10 to 20 minutes. The skin will come off. I just microwaved the almonds in a bowl of water for 20 seconds and kept it aside for 10 minutes. The skin peeled easily. We can follow either way. Place the almonds on paper towel, so that the moisture is absorbed. Then powder it with some powder sugar and grind it to fine powder without any lumps. My alonds had some moisture, so I made a fine paste with the almonds. * Take a mixing bowl, add all the ingredients with almond paste. The butte has to be cold. Just cut the butter into tiny cubes and add. * First knead the mixture into a crumble. Then knead it to a soft dough. Since I quatered the recipe, I just kneaded using my hands. If you are going to make bigger batch, then use a stand mixer with dough hook. * Cover the dough using a cling wrap . Refrigerate for atleast 2 hours. We can refrigerate the dough for upto 3 days. * Pre heat the oven for 325 degrees Farenhiet.Take the dough outside . Flour the working surface with flour. Roll the dough into a sheet of 1/4 thickness . 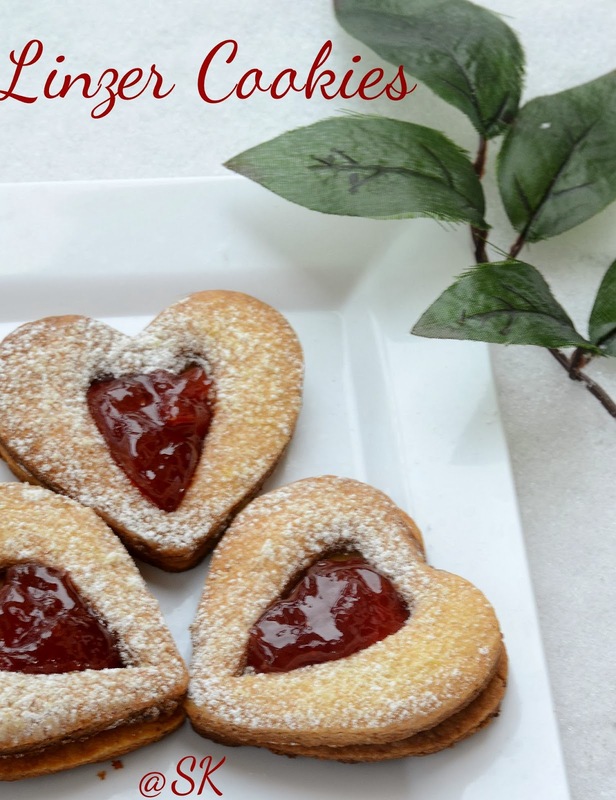 Dip the cutter in flour and cut it into heart shape cookies.Cut some cookies in the middle using small heart cookie cutter. * Place the cookies on a baking sheet . It will be bit tricky to transfer the cookies without any crack. So use a thin spatula to do the job.Since this has butter in it, no need to grease the pan. Leave equal space between cookies. * Bake for about 12 - 15 minutes or untill the edges become golden brown. Don't overbake the cookies, as they tend to blacken quickly. When they are still warm, transfer the cookies to wire rack and cool it. When the cookies are cooled, sprinkle it with powdered sugar. * Spread jam on the lower cookie and place another cookie on top. Store in air tight containers. Since the cookie has jam in it, it will moisten the cookie soon. So try to finish the cookie soon. * We can also use almond meal. * We can also substitute all purpose flour with unbleached flour. * Any preserve or filling works great. * Take care while baking, as the cookies tend to change colour wuickly. * At first the cookie may appear soft, but it becomes hard after cooling. * If you find difficult to roll the dough, just keep the dough between 2 parchment paper and roll. * Roll the dough quickly, if not the butter in the dough may make it become soft . 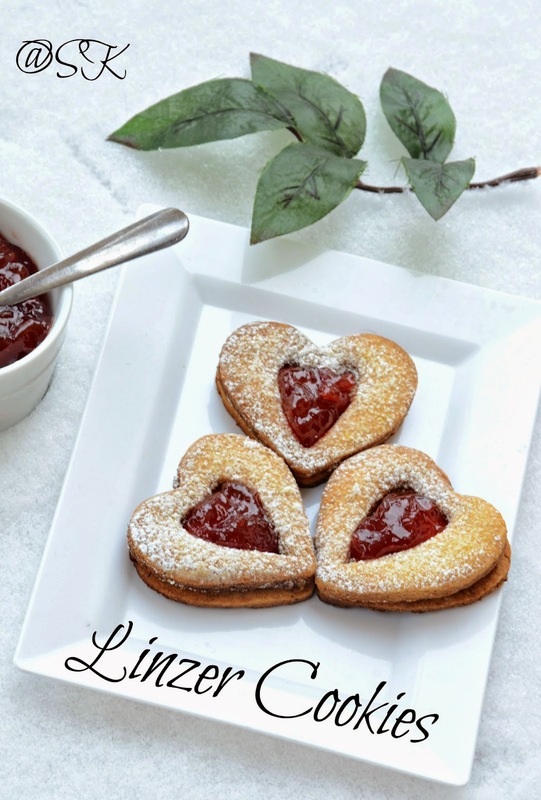 Linzer cookies look very yumm.. Perfectly baked. delicious cookies, love with almond. Cookies look so cute and mouthwatering. Excellent preparation. Such great looking cookies!! Yummm.